Judging from the excitement we see everytime we report something new about the Motorola Moto X, there are plenty of our readers who are really looking forward to seeing what this handset can do. We're not not necessarily talking about specs, but in terms of customization. And then there are those sensors that are supposed to know where you are and what you are doing. This allows the Moto X to do things like automatically turn on the speakerphone when the phone is being used by the driver of a car. We've already seen the hand twist that gets the camera application open. 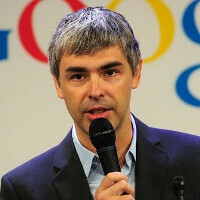 Another person closer to the device that is also excited is Google CEO Larry Page. During Thursday's conference call following Google's earnings report, Page said that he was excited about the device, but would not elaborate. When asked about the $500 million advertising campaign for the phone, the executive said, "I think we're doing things that are normal for that business." He did think that too much discussion had been made over the cost of the ads. Page said that even though Motorola is a wholly owned Google subsidiary, it is an independent company and said, "I think they're working hard on making good products, we're really excited about it, they're excited about it." He added that, "you'll get to try it out really soon." Earlier Thursday, Motorola shared a picture of the phone coming off a U.S. assembly line. "Yep. This guy is building exactly what you think he is. Designed by you. Assembled in the USA," read the caption, reiterating the news that the Moto X is the first smartphone assembled completely in the U.S. Sounds cool, I mean the specs are not going to blow you away but it can do some neat things. Hopefully, Moto markets the phone like Samsung does, by showing off its capabilities, rather than just put the name out there with some pointless advertising, like a certain other company does. Also, I would push the 'assembled in the U.S.' point. His millions of dollars worth of Apple stock disagree with you. This phone just does not interest me. The new Droid's sound more promising. Google/Motorola should pour everything into a phablet, a flagship and a mini with the best specs and vanilla Android. No Motorola phone has been able to beat the Original Droid OG. Maybe I'm wrong and Google will make me eat my words. It's hard to beat the OG Droid, since it was the only Moto android phone at the time. All there was at that time was the Moto Droid and Droid Eris by HTC on Verizon. When the Droid X came out, they also hadtheir Droid 2 and later that Moto Droid that had a similar layout to a BB (don't remember the name). The OG Droid was also before they started locking the bootloaders. There are two "not's" in the second sentence, Alan. It all depends on the price point. That's going to be the big defining touch on whether it sells or not. If it has a Nexus 4 like aftermarket cost it's going to sell like crazy not just in the US but worldwide and might takeover a large chunk of the midrange market which is huge. Plus love the fact that you can do your own little customizing and assembled in the US. Yeah and people are excited too. Ain't you?